Dear Dagan, About the dahlias..
March arrived, and at dawn’s breaking I rise to see what catastrophe has befallen my newly sown seeds and which daffodils may have succumbed to tragedy in the night and will not be worthy to go to the Greenwich daffodil show, or NOT! Dagan, the ancient God of crop fertility, was thought to be the source of feast or famine. Dagan, could you be the determiner of my dahlias’ demise or delight? Two years ago, dear Dagan, you were kind and bouquets like this were plentiful. Here is my list of dahlias for 2011 from Swan Island Dahlias. I hope you approve! The partial list for 2011: Gregory Stephen, Show n Tell, Plum Pretty, Brookside Snowball, BED HEAD!, Dad’s Favorite, Giggles, Honey Dew, Rock Star. I have high hopes for Dad’s Favorite. Since my knowledge of ancient Middle Eastern Gods is nil, I hope and pray I haven’t dipped my toe into disaster by appealing to Dagan. Think I’ll do a little investigation on that point and if this post disappears into cyber space, know that Dagan was not a God to be trifled with on any score! Wait! Do I see a little damping off in the lettuce tray? Oh, help! 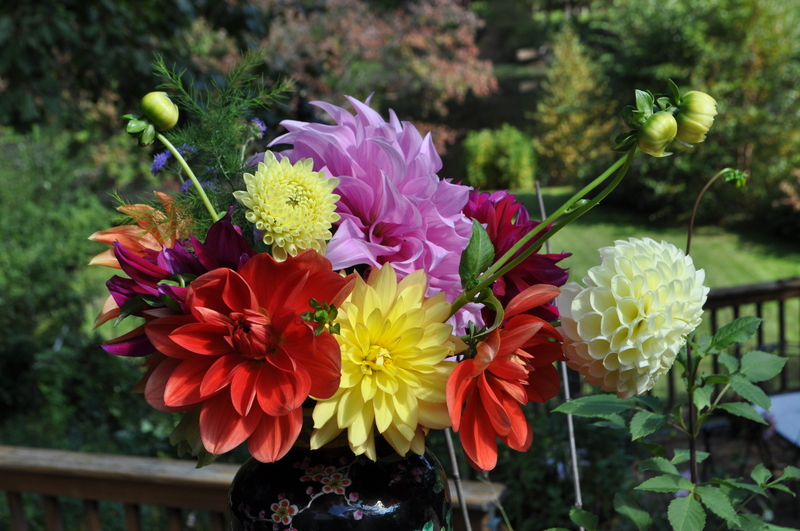 This entry was posted in Uncategorized and tagged Dad's Favorite, dahlias, Swan Island Dahlias. Bookmark the permalink. 2 Responses to Dear Dagan, About the dahlias..
i must have some of those dahlias. Bed Head is a favorite! Send that photo to Fine Gardening! As per previous comment, I love it that I can admire them from afar, watch them grow under someone else’s (neverending) loving care and enjoy this wonderful photo…Hah!